Nikka can lay claim to being the first Japanese whiskey distillery. Founded in 1934 by Masataka Taketsuru, the Yoichi distillery produced some of the world’s finest spirits. With this initial success, the company now has four separate distilleries in Japan and another in Scotland, along with several bottling and aging facilities. 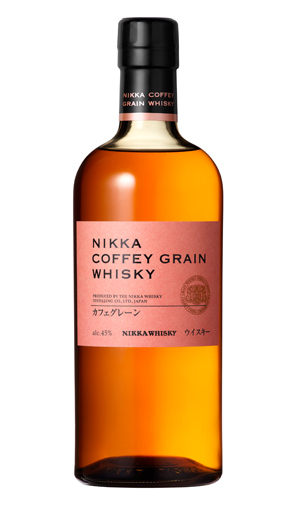 Nikka Coffey Grain Whisky is made at the Miyagikyo plant in Sendai, using a still imported from Scotland in 1963. The base grain is corn, which adds a bourbon-like sensibility the flavor profile. If you were thinking that it is flavored with coffee beans, you’d be wrong. The Coffey in the name refers to the type of column still created by Irishman Aeneas Coffey, who ironically could not get the Irish to embrace his revolutionary product back in 1830. So, he took his invention elsewhere and now it is employed in virtually every distillery in the world (including pot still holdout Ireland). Nose: Warm, elegant, and slightly fruity. Taste: Quite smooth and restrained, yet delivers a rich and perfectly aged flavor. Notes of vanilla, honey, cinnamon, raspberries and black tea. Finish: Spicy and masculine, yet there’s an underlying sense of spun sugar and sweet corn. Overall: Somehow they’ve captured summer in a bottle. Very well done and a testament to the Nikka company’s devotion to creating high quality products.